NutriAid Menopause Supplement is proven to assist against symptoms of menopause. This product is available and is especially manufactured in the United Kingdom. NutriAid has 9 different nutrients combined together as a daily supplement. This supplement helps women with the before, during and after their monthly cycle symptoms. NutriAid Menopause Supplement contains combined nutrients which helps balance hormonal levels and helps soothe, relax and refresh women that are experiencing difficulty as well as giving them energy, vitality and promotes over-all well being. NutriAid Menopause Supplement is made of herbal ingredients combined together to give women the assistance they need during this difficult stage in their life. Pffafia – a Brazilian plant which is also known as the Brazilian Ginseng. Unlike the Asian Ginseng, it has become very popular for thousands of years by the Americans and Japanese as a cure for menopause. Dong Quai – has been used for a long time to help women deal with menstrual problems and most recently, it has also been studied to help with menopause. It helps replace estrogen and is very helpful as women who are in their menopausal years have problems with fluctuating estrogen levels. It also helps relieve stress as it balances hormonal levels. Wild Yam – is a natural alternative for estrogen and helps with postmenopausal vaginal dryness. Evening Primrose Oil – a plant rich in GLA or gamma-linolenic acid, which is a fatty acid that is involved in producing prostaglandin and helps deal with hormonal changes during menopause. Mexican Yam – has the same effects and uses as the wild yam. Agnus Castus – has a balancing effect on hormones. Black Cohosh – is an herbal plant from North America that has been used to help control the symptoms of menopause such as headaches, hot flashes, mood changes, sleep problems, heart palpitations, night sweats and vaginal dryness. It is also used to regulate periods and help ease PMS symptoms. Sage Leaf – helps in controlling hot flashes and night sweat. Siberian Ginseng – affects hormonal levels and affects tone large uterine muscles which help comfort menopausal symptoms. The product does not contain gluten, lactose, sugar, artificial coloring or yeast. The recommended intake is 1-4 tablets daily or as recommended by your doctor. NutriAid Menopause Supplement is better to be taken in higher dosages with breakfast and dinner for 3 to 4 weeks and then gradually reducing the dosage. Studies show that best results are achieved when the product is taken continuously for 2 to 4 months with managed eating habits and combined with eater retention tablets or Candida Cleanse. 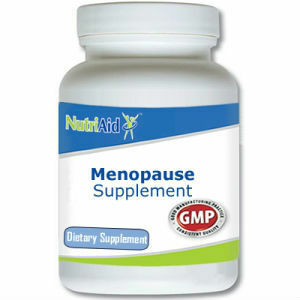 A bottle of NutriAid Menopause Supplement is available for £19.99 but is offered on a discounted price of £14.99. They also have specials which you can check on their website but there is no reported money back guarantee. NutriAid is only one of the many medicines to help relieve menopause symptoms and it may actually work for you. There are a lot of factors to consider though, like the amount of capsules you take in a day. Jackie Horowitz	reviewed Nutriaid	on May 19th	 and gave it a rating of 2.